We worked out of that camp for almost a week. The routine was the same each day: Wake up at dawn, eat a hurried breakfast (instant noodles, rice, and sometimes dried fish), hike up the main stream, then set off along an unexplored smaller stream. All the while meticulously searching for leeches. Mr. Dau and I quickly fell into a search routine. He would walk ahead of me stirring the ground and vegetation with a walking stick and I would follow behind at a slower pace. His sharp eyes would pick up leeches that were perched and waiting for their next meal. His ability to spot these leeches—even before they had wriggled to reveal their presence—was uncanny. I would follow behind at a slower pace. My job was to pick up the movement of leeches that had been awakened. We worked long and hard hours. Unfortunately we never got the leech numbers that we were hoping for. My personal belief is that even the wet areas around the streams were too dry to support high leech concentrations. It’s possible that the area didn’t have high enough prey biomass—but the abundant pig sign seems to refute that. But again: It’s better to pick up fewer leeches in good forest than many leeches in a poorer area, and this part of Pu Mat looked promising. 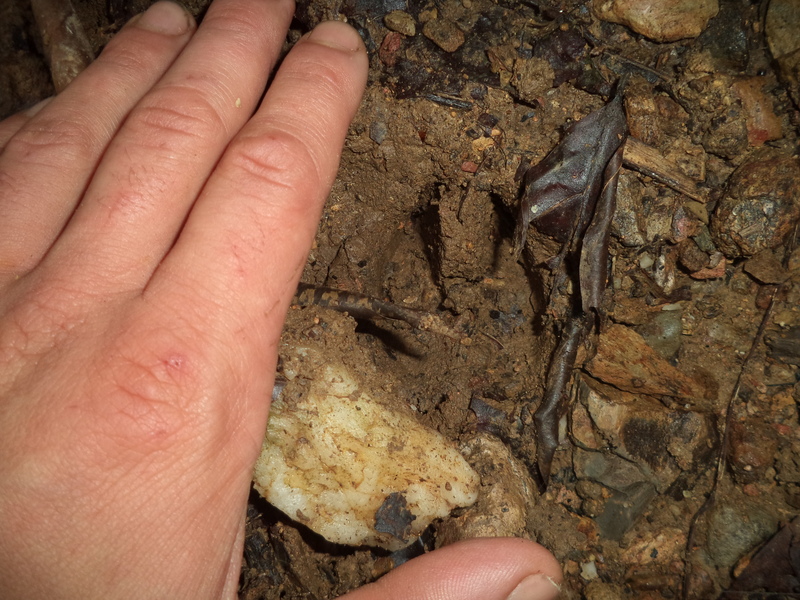 We continued to find wild pig sign and on one occasion came across a probable serow track that was no more than a day old. If it was serow it would be proof that at least one other large ungulate was roaming these forests. At last it was time to leave. I found myself wondering, as I always do at the end of a survey, where the time had gone. Life in the forest—in the absence of clocks, cell phones, internet—has a timelessness that causes the days and even weeks to melt together. I was sorry to leave this area—there was much more work to be done—but we were one a tight schedule and had to get back to Vinh. We woke up earlier than usual on the last morning so that we could try to make the hike back to the army post in one day. It made for a hard day but several blistery hours later we walked through the outpost gates. A pot of fresh tea was waiting for us. We were very tired. Even though we had only been gone for a week I still felt like it was a culture shock to get back to civilization. It was odd to be back within four walls. Even before I had taken off my backpack I was thinking about how badly I wanted to get back into the jungle. The next stop for me is Vinh. I’m taking some time away from fieldwork to do some grant writing. The search for future funding never really ends. Then I’ll be traveling south to the city of Hue, located in central Vietnam. In Hue I’ll be preparing for intensive surveys in the Hue and Quang Nam Saola Nature Reserves. I’m excited about this opportunity. The Central Annamite Mountains contain some of the best forests left in Vietnam. And they represent one of the best places in the world to look for rare Annamite endemic mammals, including striped rabbit, dark muntjac, Large-antlered muntjac, and—the holy grail—Saola. Longer stretches in the field means that it will be more difficult for me to keep you, the reader, up to date. But I should have some stories to tell when I come out of the jungle! I’m back from a great trip to a protected area called Pu Mat National Park. I went there with a group of biologists from Vinh University. Dr. Cao Tien Trung, Dean of Zoology at the university, facilitated the trip, and I’d like to start off by thanking him his help. I’ll write about this trip over the next several postings. 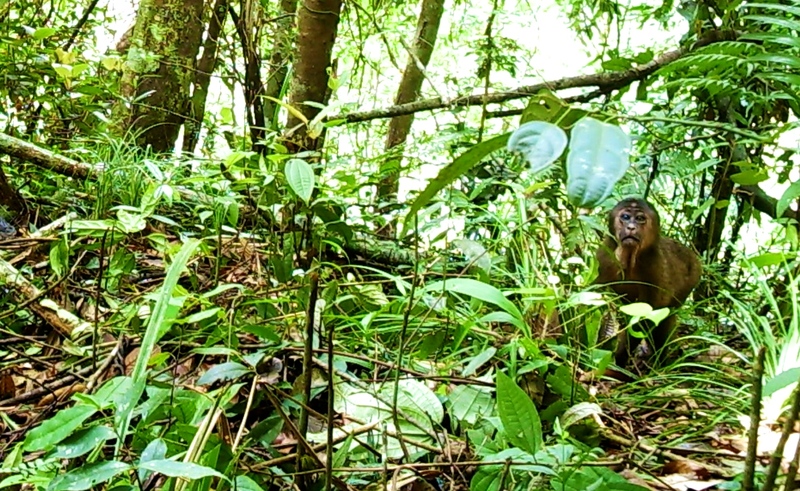 Pu Mat is located in Nghe An Province and is one of the most important sites for mammal conservation in Vietnam. Past surveys have confirmed the presence of Annamite dark muntjac, Large-antlered muntjac, Saola, and Annamite striped rabbit. (In later posts I’ll write about these species and include pictures so that you have some idea of what I’m talking about. Put a name to a face—quite literally, for the primates.) It also has one of the only viable populations of northern white-cheeked gibbon (Nomascus leucogenys) in the world. As with any field expedition this one had its ups and downs. It took some time to get into the forest. Let me give some unasked-for advice. One of the most important traits for a field biologist to develop: Patience. It took several days to obtain the necessary permissions to travel into the protected area, which, because it borders Laos, is a politically sensitive zone. But Trung handled the situation very efficiently. By mid-week we were at a remote army outpost and ready to head into the field. Our team consisted of two students from Vinh University and two local guides. After an initial false start―we were told by our guides that our planned route was unfeasible because we couldn’t cross one of the rivers that had recently flooded—we set off on a long hike into the jungle. Our goal from the outset was to get into lower elevation wet broadleaf primary forest. The topographical complexity of Pu Mat (it is very mountainous) and its extensive past-use history (it has experienced varying levels of deforestation) gives rise to diverse habitat types. We knew that finding what we were looking for would take some effort. We hiked all day along a stream for the first day and then made a camp. The forest seemed mid-succession secondary to me: not bad, not great. But after 8 hours of walking with heavy packs and night approaching quickly we were ready to call it a day. The next morning we continued our hike along the stream. The term “hike” is somewhat misleading―there was a lot of climbing involved. Gradually the forest changed. Instead of dense stands of medium-sized bamboo sticking out of the hills like clumps of overgrown pipe-cleaners we saw more and more trees. Tall trees that formed a closed-canopy overhead. When we stepped off the stream into the forest you noticed that it was dark: little light reached the forest floor through the canopy. The few stands of bamboo we did come across were larger, taller, more impressive. Some would have easily shaded a two-story building. We continued hiking and the forest continued to improve. After another hour we were in what looked like primary forest—or very close to it. By lunchtime we had stumbled upon a softshell turtle. Because turtles are so heavily hunted in Vietnam this was a rare site. (I haven’t identified it to species yet, but will try to do that at some point. If you have suggestions please let me know!) I took it as a sign that we should stop here. Aching legs helped make the decision. Our guides agreed that this would be a good place for large mammals. Wild pig tracks along the riverbank showed that at least Sus scrofa was present. 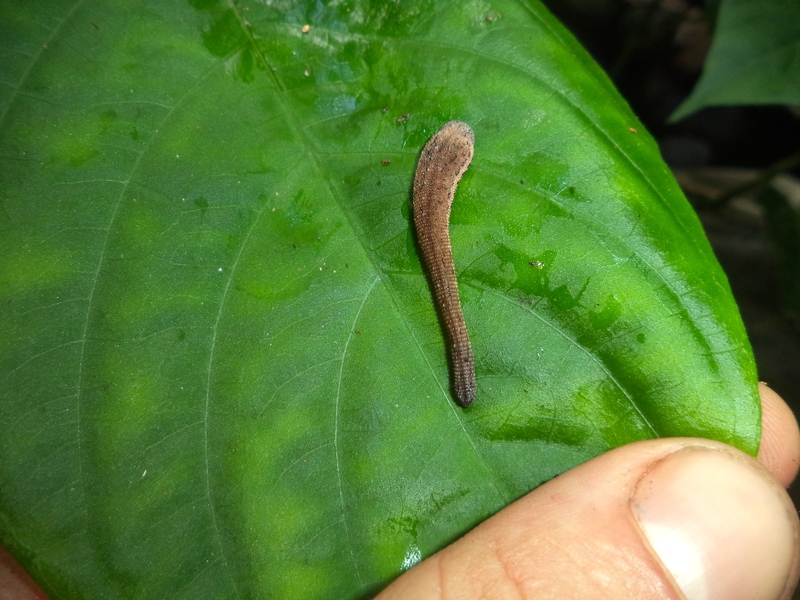 And the icing on the cake: leeches climbing our legs.